What’s the Difference Between a Plush and Firm Mattress? Before purchasing a mattress, it’s important to know the type of feel that your body needs. Do you need a plush mattress or a firm one? Which will give you necessary comfort for healthy sleep? Let’s break down the differences and benefits associated with plush and firm mattresses. What is a Plush Mattress? A plush mattress is a mattress with a soft feel. It’s the type of mattress that you gently sink into, cradling and hugging you as you fall asleep. What is a Firm Mattress? A firm mattress is, well, firm. It shouldn’t necessarily feel like a plank of wood but it’s the type of mattress that doesn’t have a ton of give. A firm mattress doesn’t have that sinking feeling but instead has sturdy support. Everyone defines comfort in their own way. This is because we are all different shapes and sizes. What is comfy and cozy for one person may be horribly unpleasant for another. When shopping for a mattress, you have to think about your height, weight, sleeping position, and if you have any medical conditions, such as back issues or hip pain. You also have to listen to your body and figure out if you need firm, sturdy support or plush pressure point relief. If you have nerve-related back pain or back pain from an injury, a medium-firm to firm mattress is the best option. Stability is key. If you’re sinking into your mattress, that lack of back support will simply result in more pain. However, keep in mind that back pain doesn’t always mean they you need a firm mattress. If you’re waking up in the morning with back pain that subsides as the day goes on and you don’t feel like you are sinking into your mattress at all, that may mean your mattress is too firm. Opting for a plush mattress or adding a topper to your current mattress can help ease that back pain. A plush mattress is the best option if you’re a side sleeper looking for pressure point relief. If you’re a side sleeper with shoulder pain, sleeping on a firm mattress will only exacerbate that pain. It could even be the cause of the discomfort in the first place. We typically recommend side sleepers have at least one layer of Talalay latex in their mattress, specifically the top layer of their mattress. Talalay is soft and pillowy. It’s excellent for pressure-point relief because it gently cradles the body as you drift to sleep. Talalay is also recommended for those suffering from hip pain. Again, a firmer mattress will only put more pressure on your hips (your hips take on most of your body’s weight) so a plush mattress is key. A top layer of Talalay latex (typically Soft Talalay) will add necessary responsiveness, giving your hips relief. What if I’m a Stomach Sleeper? We’ve shared useful information for those who sleep on their back and side, but what about stomach sleepers? Overall, stomach sleepers need a firm mattress. If a mattress is too soft, this will cause your stomach and hips to sink in and with that, your back to bend. You’ll wake up uncomfortable and sore. Do you need a firm mattress but your partner needs a plush one? Don’t worry—you don’t have to sleep in separate beds to get what you want. 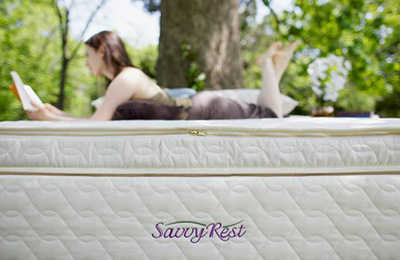 Savvy Rest organic mattresses can be split so one side of the mattress differs from the other. The Unity Pillowtop has four 3″ layers: it is simply the 3-layer Serenity organic mattress with the Harmony latex topper on top for added luxury. The Tranquility is made just like the Serenity, but with two 3″ layers of natural latex. It’s a good choice for toddler beds, bunk beds, or smaller adults. We believe comfort shouldn’t involve compromise. Everyone should have exactly what they need to get the sleep they deserve. Sweet dreams! Mattresses pose a serious problem when it comes to disposal. These large household products take up more than their fair share of space in landfills because they’re difficult to compact, clog machinery, and create large soft spaces that can turn into sinkholes after filling. The problem of mattress disposal can be confronted from two sides. The first is to recycle old mattresses, reusing their components to make new products. 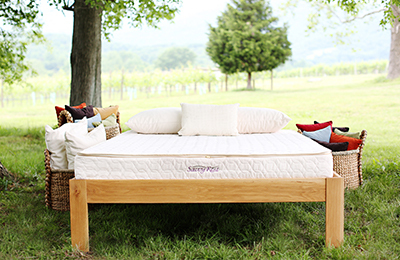 The other side of the equation involves purchasing organic/natural, biodegradable mattresses. For those in the hotel industry, understanding how to make smarter mattress purchase and recycling decisions can help positively impact green programs your organization may be undertaking. Mattresses are a complex product with numerous recyclable components. Mattress recycling programs deconstruct the bed, removing the materials that can be reused or repurposed. This process not only prevents the mattress from entering a landfill but also reduces the need to use more natural resources in product manufacturing. Foam: The foam used in the comfort layer of the mattress can be compressed to make carpet padding, oil filters, mats, and upholstery stuffing. Fabric: The exterior fabric, whether it’s natural or synthetic, can be shredded and made into other textiles. Metal: Innerspring mattresses can have as much as 25 pounds of steel coils. Once removed, these coils can be melted down to make tools, construction materials, and auto parts. Wood: The wooden frame of a box spring can be used in flooring or chipped to be used as mulch or compost. Not all recycling facilities offer mattress recycling. Hotels are in a unique position, with the high number of mattresses they require, to develop mattress recycling programs within their local communities for their use and the use of community members. The other side of mattress disposal is making wise purchasing choices. Everyone from private consumers to large hotel chains can make purchasing decisions that protect the environment. While there’s not a mattress available on the market today that will completely break down without a trace, there are 95 percent biodegradable mattress options. Natural latex mattresses begin as sap from a rubber tree. Through one of two manufacturing processes, that sap eventually becomes a natural latex mattress. Of the two processes, Dunlop and Talalay, Dunlop latex mattresses are the most biodegradable and won’t create sinkholes in a landfill. These mattresses come with a high price tag, and they will still be composed of anywhere from 5-40 percent synthetic latex. Global Organic Textile Standard (GOTS): GOTS certifies that both raw materials and their derivatives are 95 percent organic. Cradle to Cradle: Cradle to cradle looks for carbon emissions, water conservation and ecological impact throughout the manufacturing process. It’s used to monitor latex and organic materials used in mattress covers. United States Department of Agriculture Organic (USDA): This certification evaluates any crops or agricultural products used to produce components of the mattress. Taking the time to recycle old mattresses and research your next mattress purchase are both great ways to keep mattresses out of landfills. For an example of a hotel that is currently undertaking a mattress recycling program, check out this recent article on Hilton’s recycling initiative. Many people are perplexed to learn that not all latex is created equal. There is a natural form of latex and synthetic. As a matter of fact, there is a world of difference between natural latex and synthetic latex. Natural latex is manufactured from sap tapped from rubber trees, then it is either vulcanized (Dunlop method) or frozen, then vulcanized (Talalay method.) I don’t want to get too involved in which method is better, because it’s hugely dependent upon the processing facility and a number of other factors. The point is, natural latex is an incredibly resilient and durable, clean and supportive material. It is resistant to dust mites, anti-microbial, antifungal, and hypo-allergenic. The important thing to remember when considering a product made of natural latex is purity – what is the percentage of pure natural latex vs fillers or synthetic material. Look for certification by an independent laboratory such as Oeko-Tex, which tests for chemicals and toxins in the finished product. The Oeko-Tex stamp of approval will attest to the cleanliness and purity of the product. Some manufacturers add fillers (most commonly clays, calcium oxide, or titanium dioxide) to the natural latex to make it go further (imagine taking one gallon of milk and diluting it with water to create two gallons of milk). While the finished product will be less expensive, the addition of fillers ultimately makes the latex less durable and more apt to rapid breakdown. Here’s where the consumer needs to be very vigilant…the fact is that natural latex with additives such as those listed above can technically still be called “natural latex”. Synthetic latex (aka polyurethane foam/memory foam) is made of petroleum by-products, sometimes actually mixed with natural latex. Again, that’s where you have to be careful. There are many manufacturers who tout their product as “natural latex”, when in fact it’s actually a blend of natural AND synthetic. Interestingly, Dunlop and Talalay latex can be either natural or synthetic. Needless to say, Caveat emptor — do your research. Purchasing an organic mattress and/or bedding is a very sensible purchase. As humans we spend 1/3 of our life sleeping. The fact is, our bodies are continuously breathing and absorbing whatever chemicals are used in the products we sleep on. There is growing concern that many of these chemicals widely used in conventional mattresses may be harmful to our health. When you purchase an organic mattress or organic bedding, you’ll be eliminating the hazardous chemicals from your bedroom and creating a healthier, non-toxic sleep environment. A comfortable night sleep is important, but a comfortable, healthy and safe night sleep is essential. BENEFITS OF ORGANICWhen you purchase an organic mattress or organic bedding products, you’ll be eliminating the hazardous chemicals from your bedroom and creating a healthier, non-toxic sleep environment. Purchasing an organic mattress and bedding is not only an investment in a comfortable night sleep, but its also an investment in your overall health and wellness. The great thing about organic mattresses is that there’s no loss or downgrade in comfort or safety vs a conventional mattress. Organic mattresses are made using the same techniques and as their non-organic rivals, but without the harmful chemicals associated with conventional mattresses. The highest quality organic materials and craftsmanship are present in all products represented at the Natural Mattress Company. The only thing you’ll be losing is the toxicity and potential adverse health risks that conventional mattresses provide. If you’re interested in buying natural latex mattresses but don’t exactly know where to start, here is the basic information you’ll need to know. Even if someone sells a mattress as “100% latex” it’s not technically true. The natural sap from the rubber tree has to be processed in order to be able to form latex layers or cores for the mattress. If the sap was processed at 100%, it would be to thick to form the natural layers in the beds. The manufacturing process involves adding a few minor additives which is why the actual percentage is between 95-97% latex. Many bedding companies use blended latex, where they use only 5% of natural latex and the remaining is petroleum based foam. In the process they increase the margins and profits by misleading you the customer. If you’re in the market for truly natural rubber then the less than 5% that isn’t latex should have no bearing on the comfort or quality of the mattress when you compare it with synthetic or blended foams. This depends on the manufacturer but natural latex mattresses have a considerably long life. If you buy high-quality, natural latex mattresses and take care of it you could have the mattress for up to 30 years and still get a good night’s rest. The average traditional coil spring mattress usually lasts six to ten years. So at the end of the day, any additional cost or hassle associated with a latex mattress is well worth it considering how much longer they last. You might think that because the sap from the rubber tree comes from a tree that it’s simple to process but rubber trees only grow within 10 degrees of the equator, making the supply rather limited. Another limitation on harvesting rubber is the weather. Rubber trees can only be sliced during the dry season – which only adds up to 180 days out of the year. The rubber tree is sliced at an angle, about three feet long, allowing the serum to run into a holding container. After an hour or so the serum stops flowing and the tree eventually heals. It’s interesting to note, when the serum is harvested more than half of it is water. In order to prevent the serum from coagulating before it can be processed most companies add ammonia, which eventually washes out as it is processed. The rubber serum is then whipped in a centrifuge to separate the elements and concentrate the rubber to be used. The final step involves washing the latex through water and squeezing the excess out using metal rollers. Most foam mattresses “sleep hot” which means they absorb your body heat while you sleep, making you warmer. A latex mattress allows air to circulate which creates a cooler and more comfortable sleeping arrangement and the night’s sleep you’ve been looking for. Traditional mattresses will sag with use and time but because of the resilient material, latex mattresses are less prone to sagging providing you with a better night’s sleep. Latex mattresses are also great for relief on your pressure points while providing enough support for your back and joints. Because the latex material absorbs motion it makes it the ideal mattress for sharing. This way, everyone has uninterrupted sleep. Take a look around www.naturalmattressvt.com to see our wide selection of latex mattresses. Call us at 802-985-2650 with questions you may have. (1) Receive four shredded latex pillows (any size^) free with the purchase of a mattress*. If you don’t need four pillows, this may be a great opportunity for gift giving in the upcoming holiday season. (2) Purchase a mattress* and receive a 50% discount on a Vitality topper (matching size). (3) Purchase a mattress* and receive a 50% discount on an Afton platform bed (matching size). We know the classics: starfish, fetal, side, stomach, stick straight, and many more. However, what is the best sleep position for you and how can you get the most out of your sleep position? There are so many different ways to sleep on your side, but all help relieve and calm insomnia and chronic sleep deprivation. While sleeping on your side, putting a pillow between your legs/knees can also relieve back pain by taking pressure off your hips and lower back. P.S — many believe it is most comfortable to bend your knees towards the chest while sleeping on your side. “This position (where your torso and legs are relatively straight) also helps decrease acid reflux, and since your spine is elongated, it wards off back and neck pain. Plus, you’re less likely to snore in this snooze posture, because it keeps airways open. For that reason, it’s also the best choice for those with sleep apnea” (National Sleep Foundation). We have a few of the store’s floor models on sale! 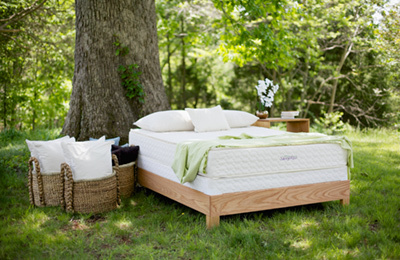 Queen Ergo 8 by Green Sleep and Twin Sized Savvy Rest Earthspring are 25% off. Twin White Lotus Organic Cotton and Wool Dreamton 50% off! We also have an in stock Queen Ergovea Valencia which is 15% off. Please stop by today to try out these practically brand new mattresses being offered at a great price! Generally speaking, lying on your back creates the most consistent support for your spine. Your muscles and tissues can relax evenly in all directions. Like a baby, or a kitten napping on its back, you can just lie flat and your musculoskeletal system will be all lined up for restful sleep. Except when that’s not true. If you have a wonky back, a sore hip, shoulder pain, breathing problems, or other bodily quirks (or you are pregnant), flat-on-back may not be the best sleeping position for you. People sleep with themselves for a lifetime, and most have figured out what position works best. If you used to sleep happily on your back, however, and now find yourself contorted into a new, uncomfortable position or using multiple strategically-placed pillows, it could be your body has been searching for a way to compensate for a mattress that is no longer supporting you. If you miss a time when back sleeping was sound and comfortable, first consider replacing your mattress. You may need something firmer than you thought, for solid back support. You may need a more forgiving surface, or denser support and a softer surface. An optional topper can offer extra cushioning that relieves surface pressure without compromising the stability you need for your spine. If you have nerve-related back pain, choose a shallower topper. The 2″ Savvy Woolsy creates a cozy, comforting surface without letting you “sink” so much that back support is undermined. If you’re petite or lean and have no serious back problems, you may love the deeper softness of the 4″ Harmony topper. Over the years, it’s not unusual to find that you prefer a different sleeping position than when you were younger. The most common change is to shift from the back to sleeping on your side. On your side, your rib cage prevents compression of the lungs, allowing freer, easier breathing. For some larger people, sleeping on the back can contribute to pressure in the chest, restricting the flow of breath. One condition that can develop with age, or excess weight, is obstructive sleep apnea. Tissues in the back of the throat collapse during sleep, blocking the airway. It’s a serious issue that, untreated, can lead to elevated blood pressure and other harmful consequences. (Central sleep apnea is triggered in the brain, not in the throat, so it’s important to see your doctor for a correct diagnosis.) Heavy snoring or gasping during sleep are clues to apnea. Many people with obstructive apnea breathe better on their sides. Those who sleep wearing a CPAP (controlled positive airway pressure) device, however, may need to sleep on their backs with the head of the bed slightly elevated. Folks with GERD (gastroesophageal reflux disease), too, can benefit from sleeping on the back with the head of the entire bed elevated. A common mistake is to use a pile of pillows under the sleeper’s head — this just puts an additional kink in the diaphragm and can worsen GERD symptoms. Two four- to six-inch blocks placed under the legs at the head of the bed create a complete incline that helps gravity keep stomach acids where they belong. If you are fit, limber, and of normal weight, you can likely sleep happily on your back – or in just about any position you like. If your body’s asking for a change, try your side or a partial-side position. Use a body pillow at your back or front to stabilize your trunk until you’re used to the change. The one sleeping position most experts “tsk” about is on the stomach, particularly while using a pillow. The pillow creates strain on the cervical spine from a kinked-back neck, and the spine is tilted upward from the pelvis. Over time, stomach sleeping will stress the lower back. Once you have the right mattress and have experimented with position, surface softness and perhaps new pillows, you’ll find it easier to recognize which way of arranging yourself gives you sound, refreshing sleep. Sleep well!